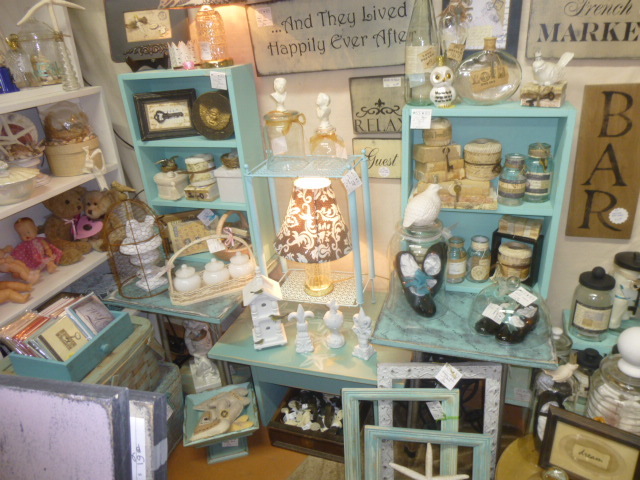 Shabby white spring make over in my booth at Stars. 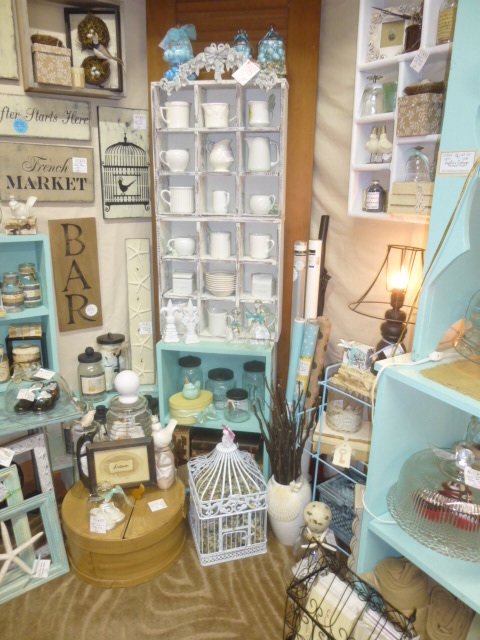 Got most of the recently completed white items displayed in my booth at Stars this week. 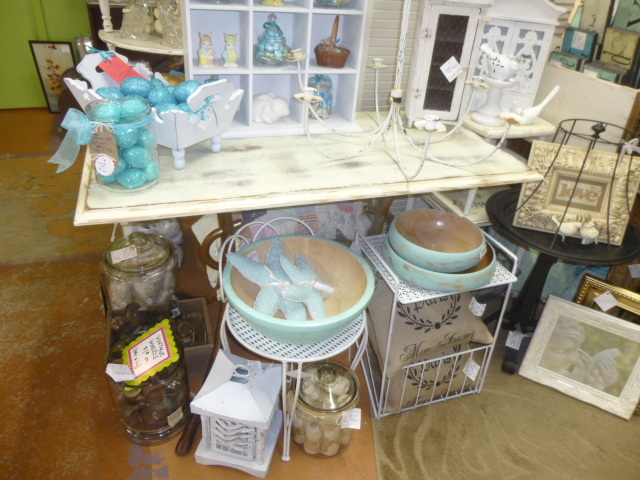 The white table (former desk top) with rusty base, corner shelf, the plain little square table, and all the candelabras set up at the front, left side. This is the view standing in front of the booth. 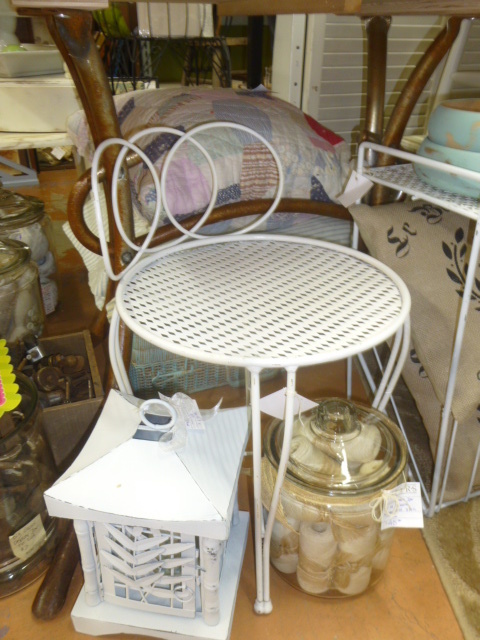 Closer view of the chair. 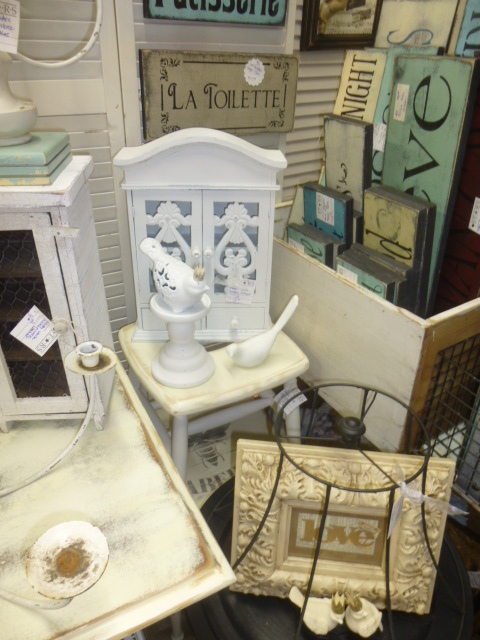 Closer look at the newspaper stand. 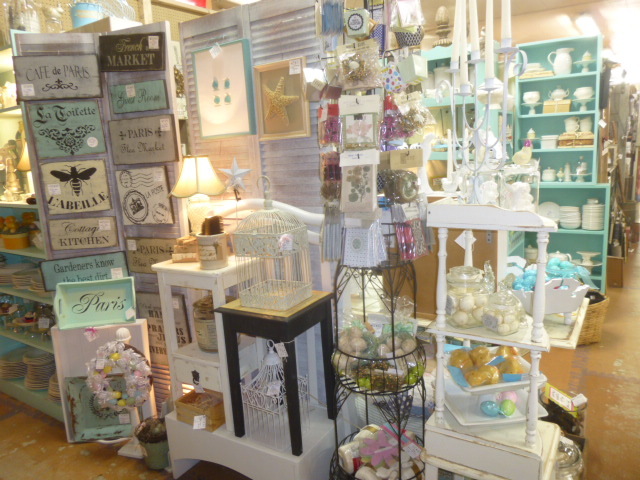 Outward facing left side of the booth. 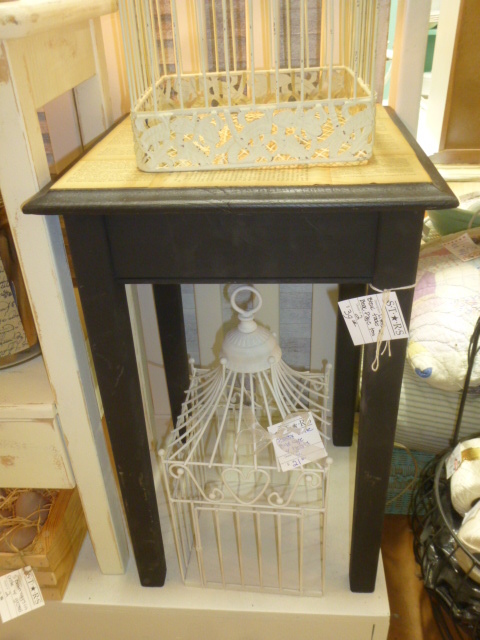 The shabby white night stand with the Lion’s head drawer pull and the tall black lamp table with vintage book pages on top, both sitting on top of an upcycled crib bench. 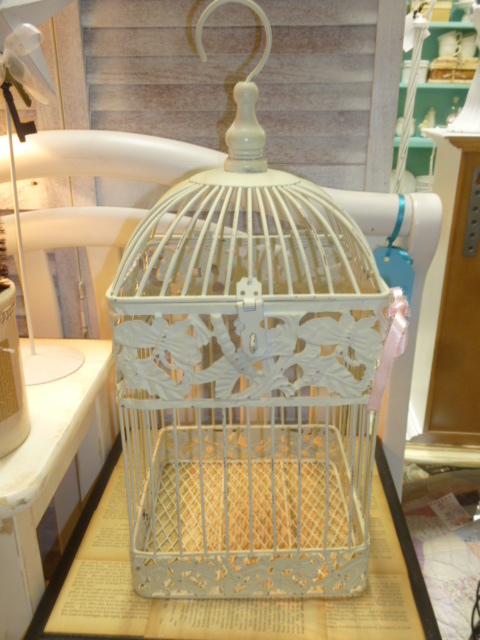 A couple of shabby white bird cages too. 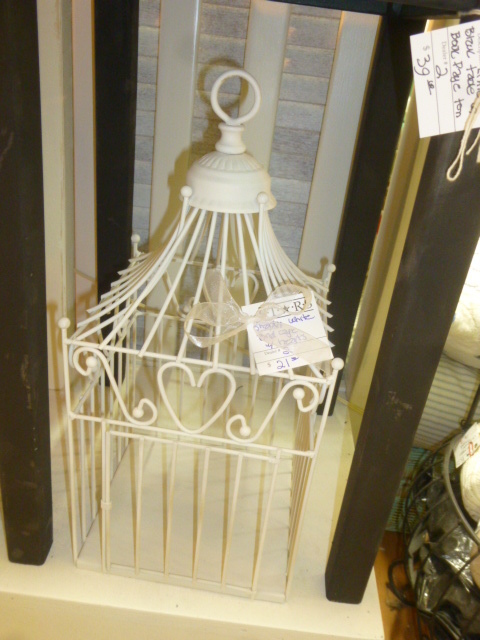 Better look at the two bird cages. 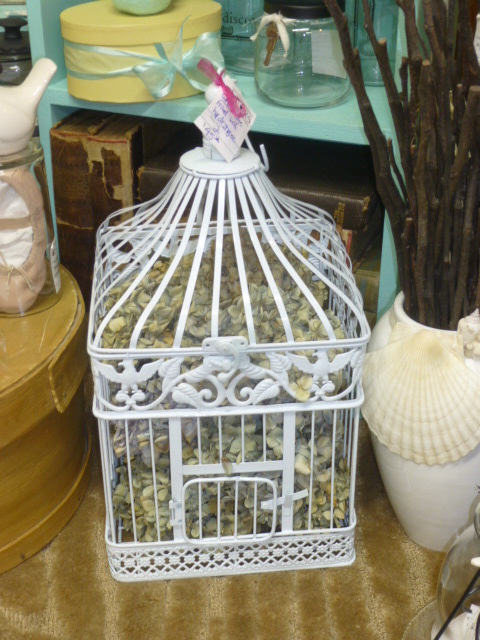 Yet ANOTHER white bird cage; this one filled with dried hydrangeas. 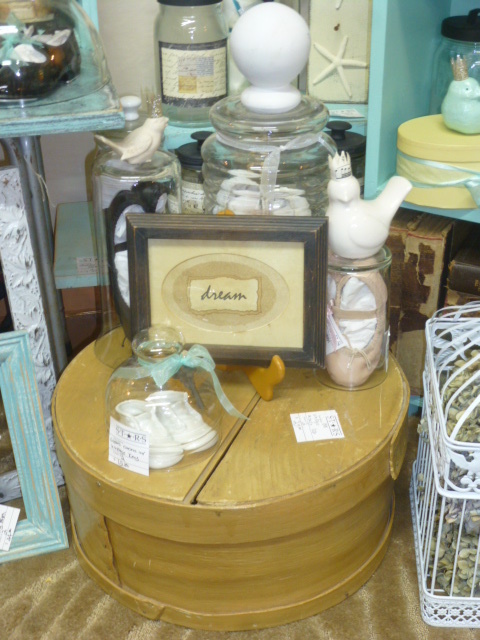 I LOVE the LOOK of dried hydrangeas. HATE how easily the fall apart and shed! 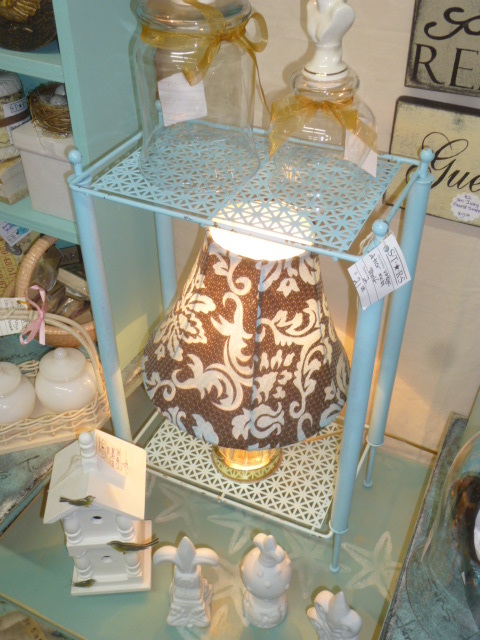 Displaying them in a cage is a prefect solution! 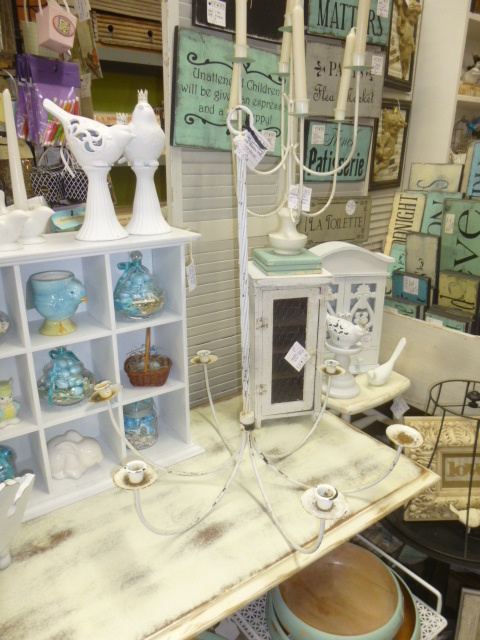 Here’s that hanging candle chandelier again; still hard to see against the white table. 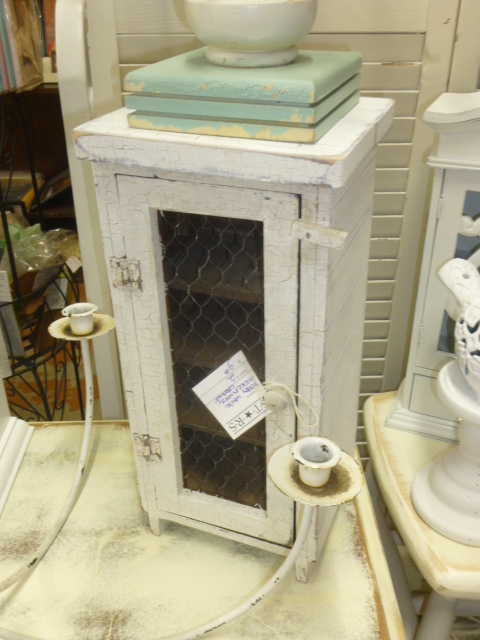 A little white cupboard with chicken wire door with a white and aqua candelabra on top; and behind that a white jewelry armoir. 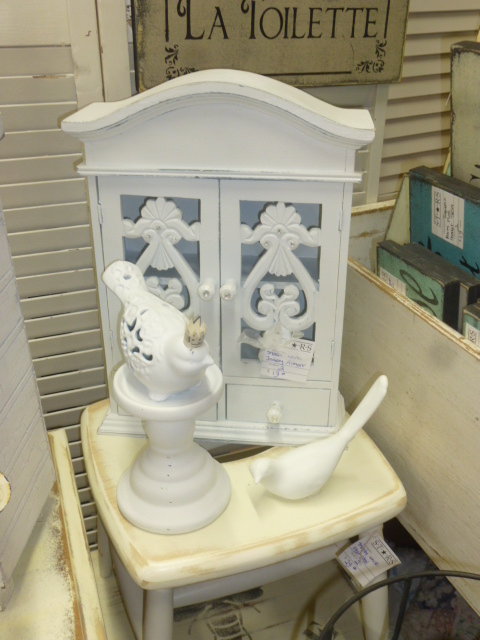 A few new white bird finials too. 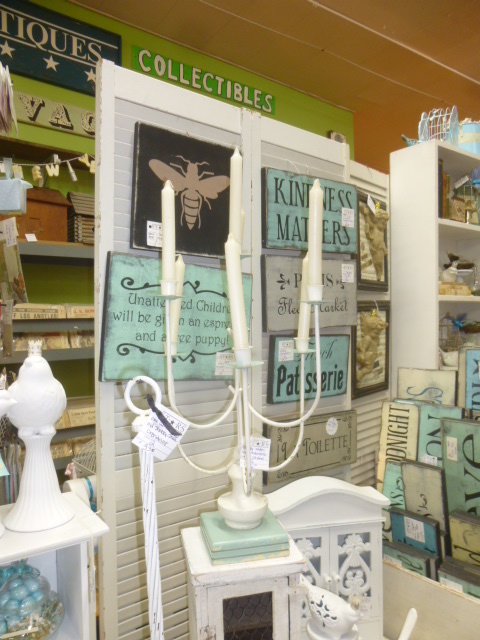 The white and aqua candelabra. 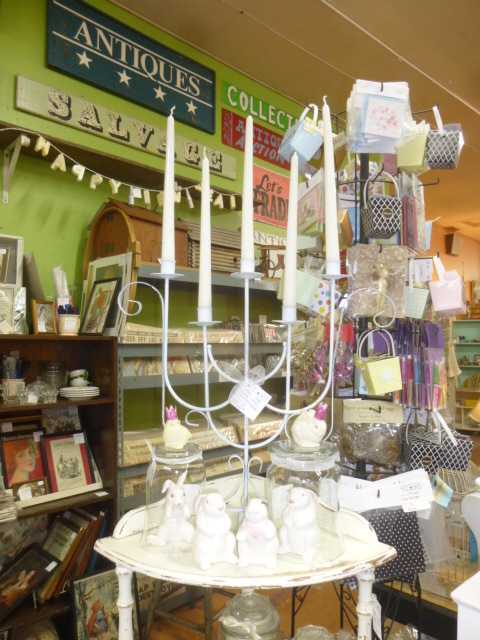 The candelabra that was black that I repainted sits atop the white corner shelf. 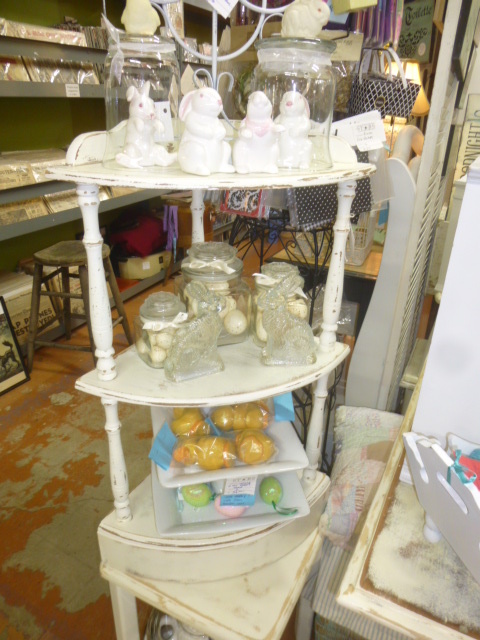 Vintage white ceramic bunnies and jars of speckled eggs on the corner shelf. 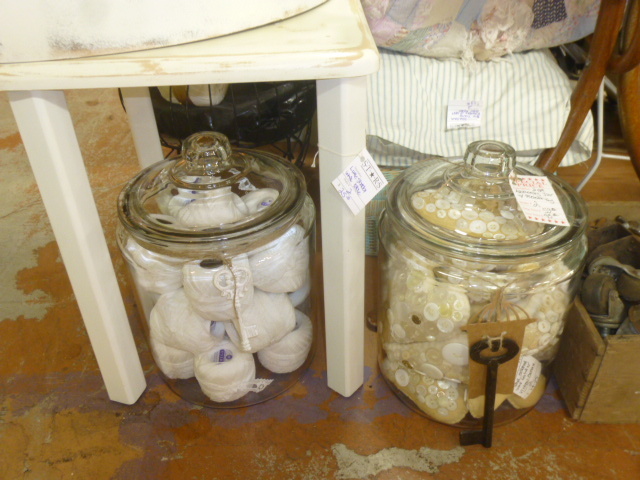 Two-gallon mercantile jars; on left filled with vintage crochet thread for sale WITH the thread included. 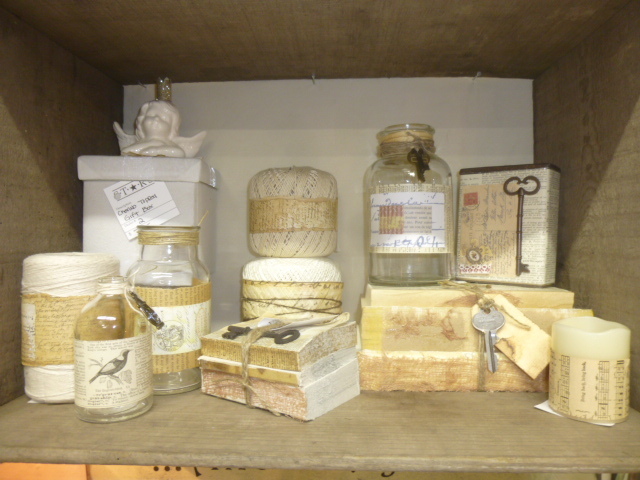 Hand stitched felt hearts with vintage buttons in the jar on the right; hearts sold individually and separately from the jar. Another jarful of vintage wool yarn. 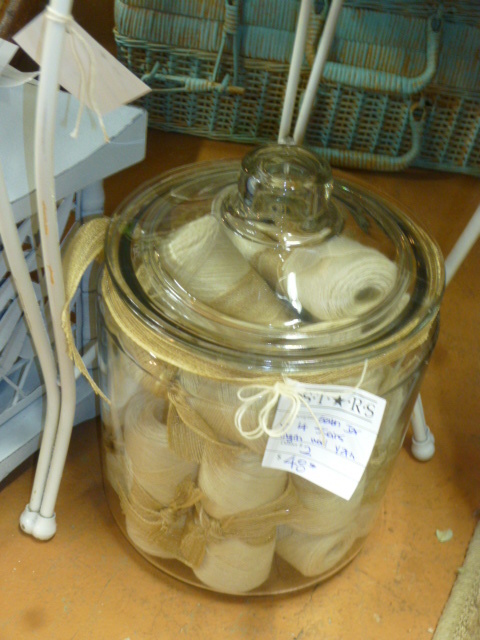 This is a 1-gallon jar; sold WITH the yarn. 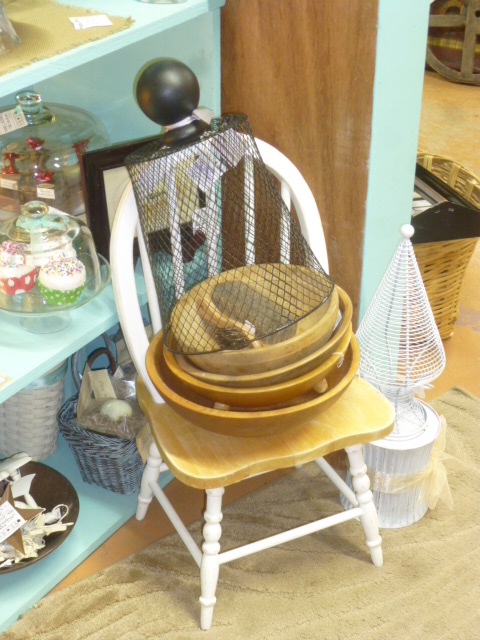 Child size bowback chair with vintage wood bowls. 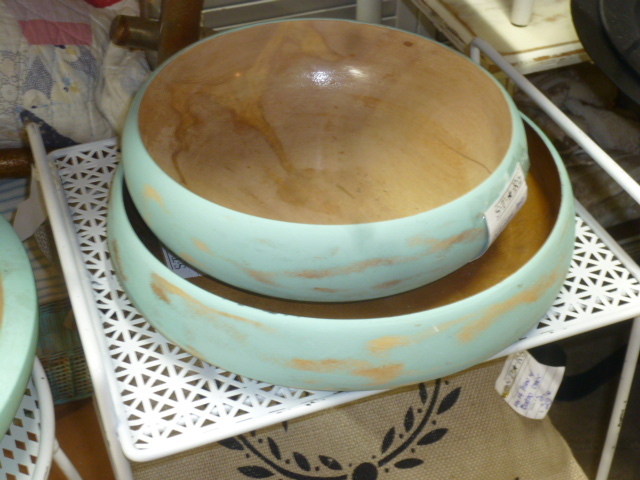 More wood bowls; these painted aqua on the outside. 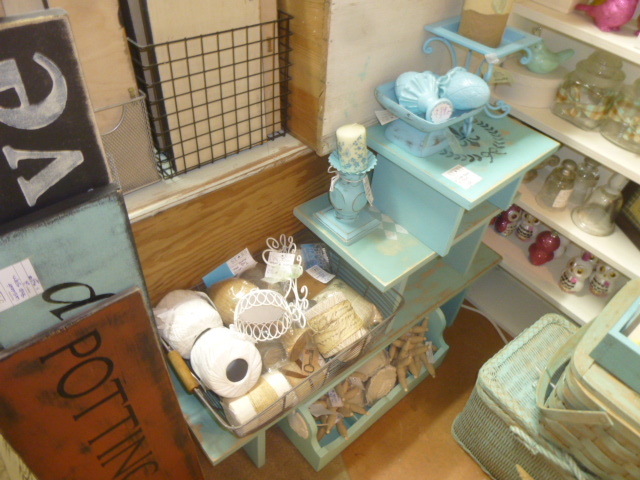 Moved the ginormous cubby shelf to the back corner of my booth. 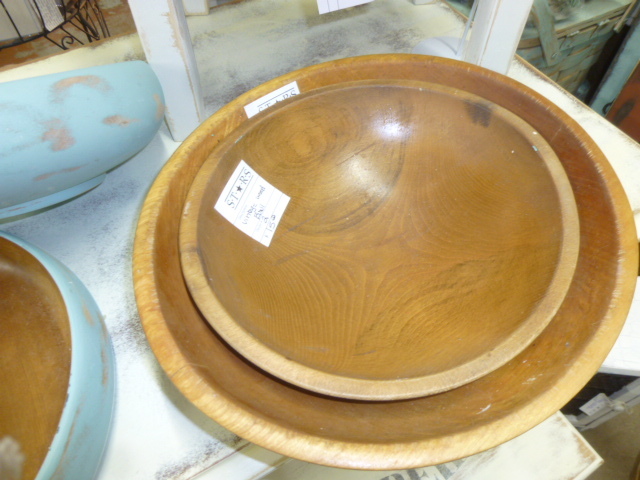 HUGE vintage bentwood cheese box. 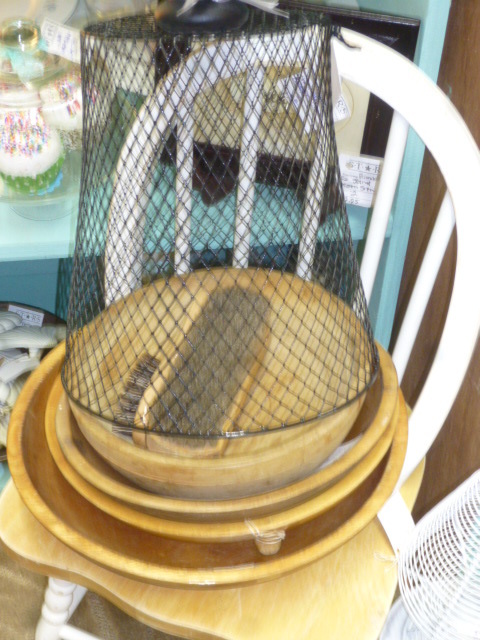 Big wicker picnic basket with starfish, smaller slat wood basket. 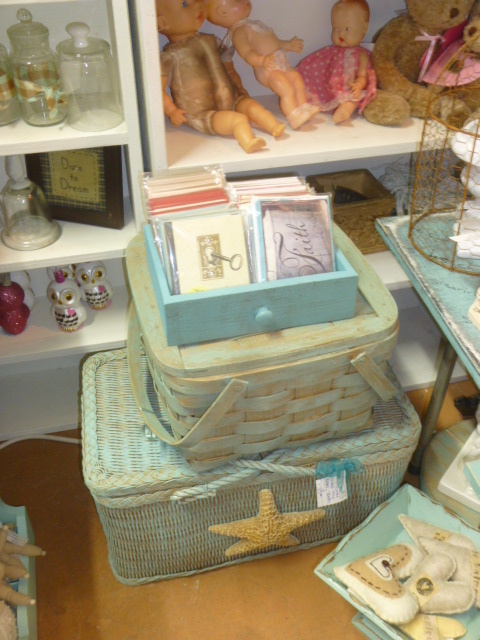 Little turquoise drawer is filled with packets of note cards. 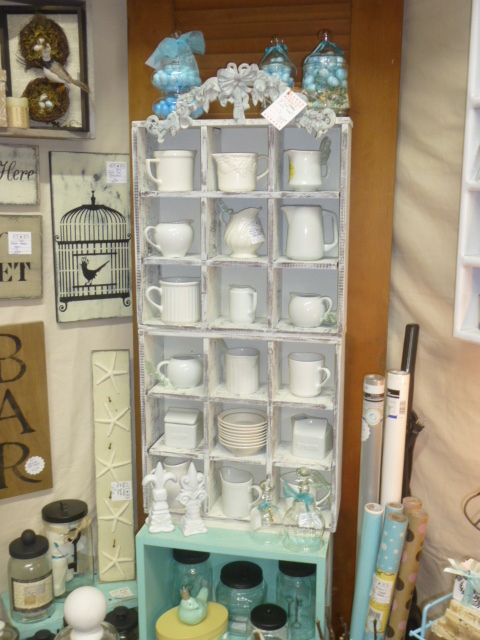 This batch of aqua shelves pretty much remain here permanently; but I DO change out what it displayed on them seasonally. 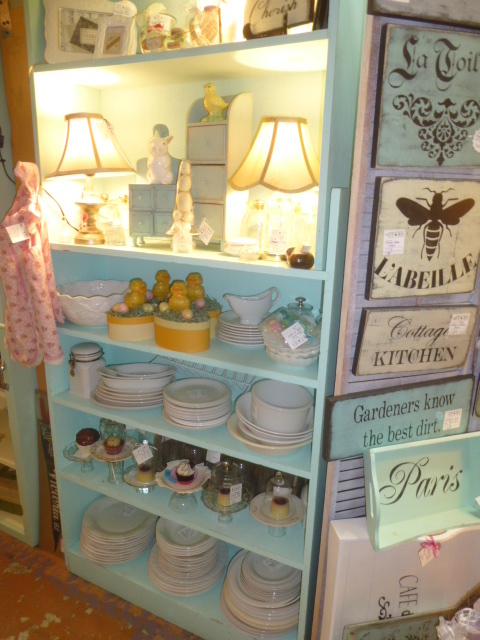 Just moved all of the white dinner plates and large serving bowls to this shelf on the outward facing left wall. 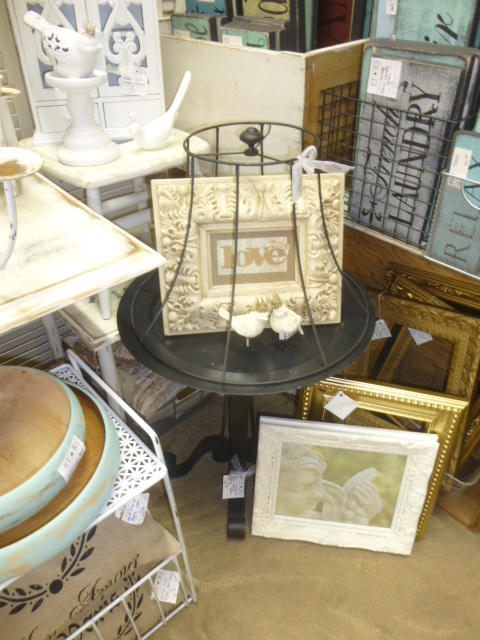 Upcycled round black table; lamp shade cloche sold separately. 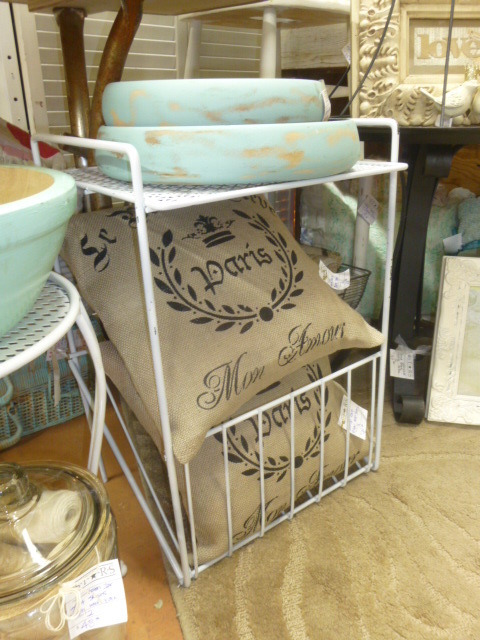 Stack of three aqua benches. 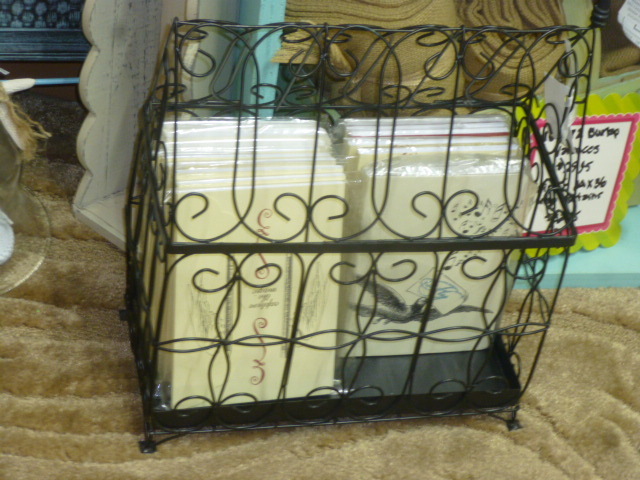 Blank journals displayed in a black wire cage. 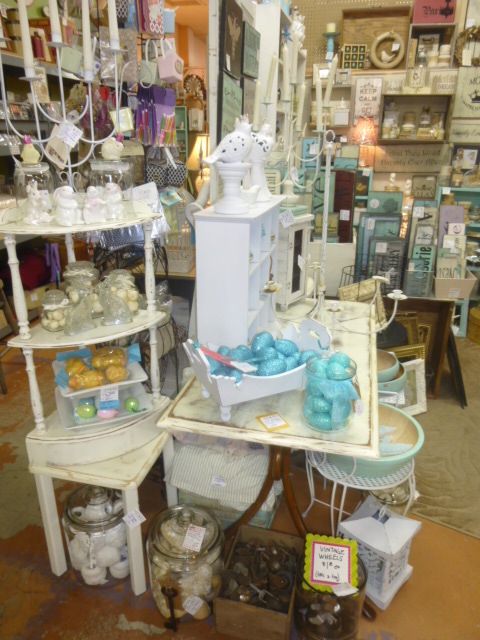 Little aqua metal stand, and a new batch of small white fleur de lis finials. 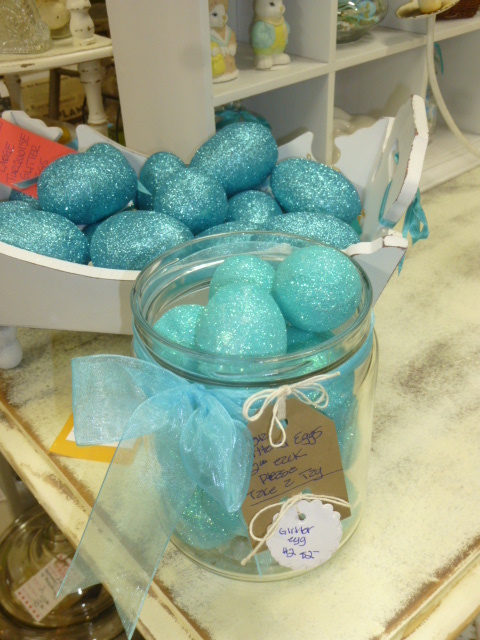 Kind of hard to tell WHAT these are at first glance?!?! 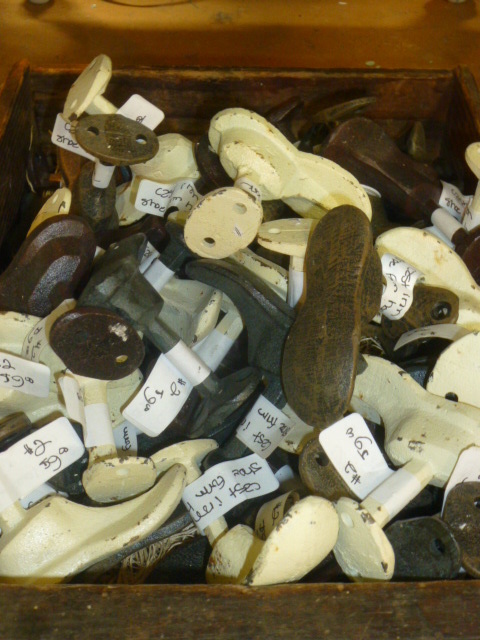 They are “mini cast iron shoe form hooks”!! Really cute. 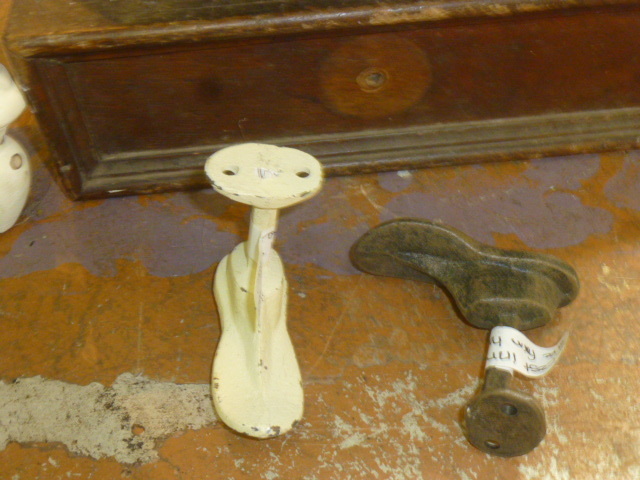 I’ve had them for EONS; intending to use them to make coat racks. After ten years it’s time to ‘let them go’! 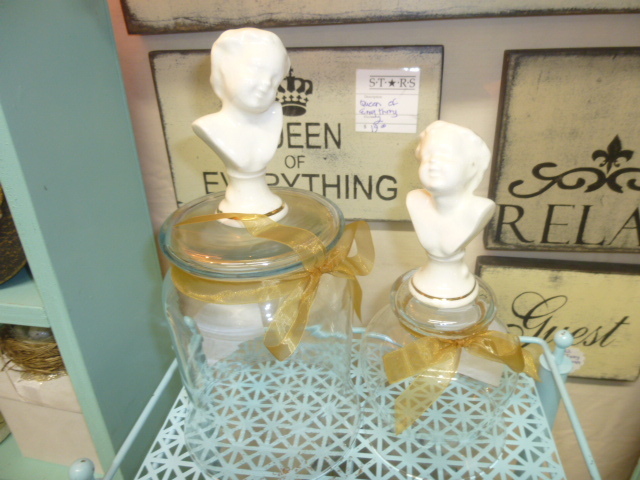 Very Paris chic cloches with cherub bust handles. 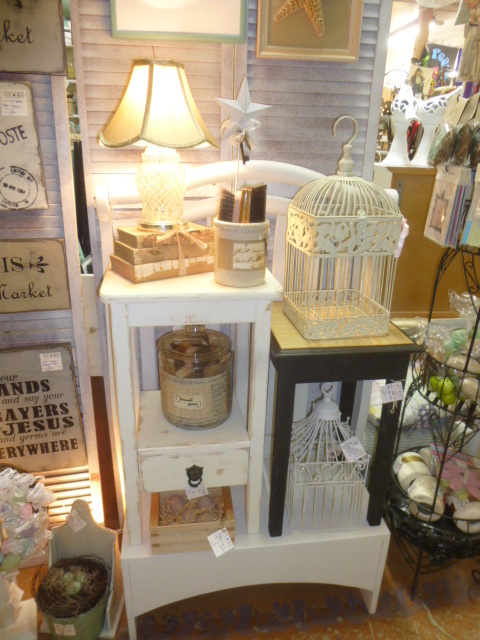 LOVE creating these ‘mini vignettes’ inside old crate wall shelves. 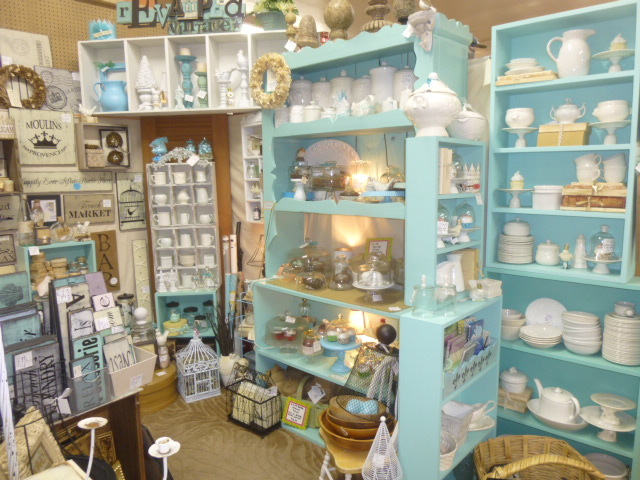 Just added some new vintage white cream pitchers too. 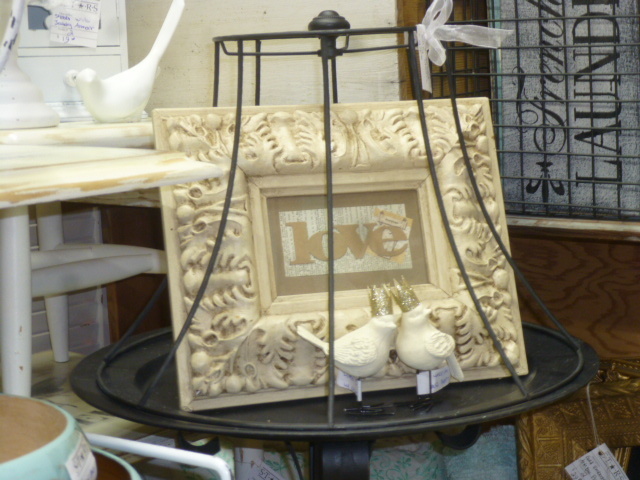 Loved ‘window shopping’ and as always, enjoy your creativity!